A plastic free, non toxic ice cube tray. With a handle to release the ice cubes easily. A two-part design tray is easy to clean. Great for baby food, stocks and homemade ice cream. 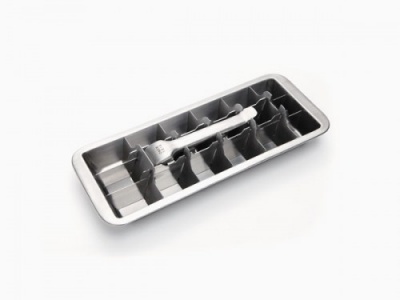 A plastic free, non toxic ice cube tray. Perfect for freezing your home made baby food, freezing fruit or extra juice for smoothies/homemade ice cream, stock cubes or just plain ice! Made from 18/8 stainless steel (same as Klean Kanteen) and designed with a two part system which goes back to the trays of 1950's. 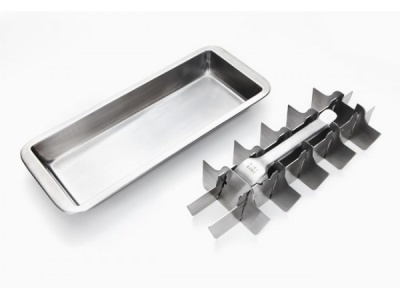 Non leaching stainless steel, non toxic. 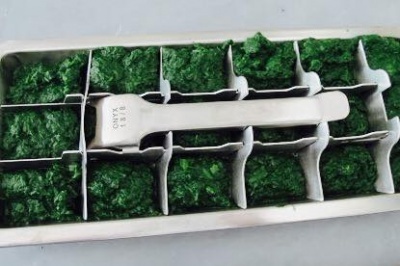 Simply remove the divider, pour your home made mixtures and re-insert the divider and place into the freezer. You can also cover with a Reusable Food Wrap if you wish. Best to store for no more than two weeks to keep fresh. Packed in a cardboard box and protected in a plastic bag with is recyclable with carrier bags.